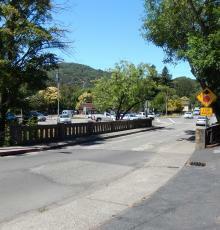 The Center Boulevard Bridge over San Anselmo Creek was built in 1940. The existing three span bridge carries two narrow lanes of traffic and is supported by concrete abutments and pier walls. 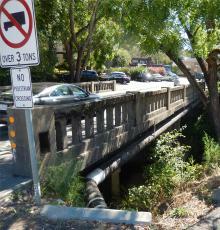 Center Boulevard is classified as a principal arterial roadway providing direct access for local residents travelling into downtown San Anselmo and connecting residents to other regional thoroughfares. Caltrans has appraised the bridge as Structurally Deficient. Additionally, the bridge’s narrow width makes the bridge eligible for replacement under the Federal Highway Administration’s Highway Bridge Program (HBP). The bridge is also a contributing factor to flooding in the area and has been identified as a priority for removal as part of the Ross Valley Flood Control Program for 100 Year Flood Protection. Throughout all phases of the project, measures will be implemented to minimize impacts to local residents, local commercial businesses, and address environmental impacts to the resources of San Anselmo Creek. It is currently anticipated that the existing bridge will remain in service during the construction of the new bridge and removed upon completion of the new structure. Consequently, the need for a traffic detour is not currently anticipated at this location. This project may impact an existing building located over the creek (former Great Acorn Building), which is currently owned by the County. Center Boulevard is classified as a principal arterial roadway providing direct access for local residents travelling into downtown San Anselmo and connecting residents to other regional thoroughfares. The existing three span girder bridge carries two narrow lanes of traffic and is supported by concrete abutments and pier walls.